Kids love rocks. We'll help you find them. Kids do love rocks. Searching for rocks brings out the treasure hunter in all of us, young and old. Finding places to rockhound with children can be a challenge. 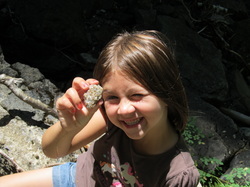 Rock Pups is a growing list of places you can find rocks with children. All the information below is to the best of our knowledge. I've only included places that I've visited with my children myself. Do You know of a great place to rockhound with kids? Let us know!